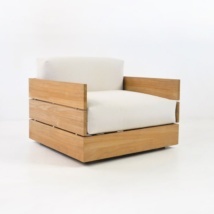 “Luxurious” is what comes to mind when you see the Soho Teak Outdoor Loveseat. This is the calming and comfortable outdoor loveseat that is focused on delivering an excellent experience every time you’re using it, without overpowering you with complexity. Sunbrella® cushions as shown in canvas are available for immediate delivery. W61" x D34" x H30"
The feel of this Outdoor loveseat is everything you’d expect of spa furniture. It has deep relaxation design cues, with the 26” seat depth and simple good looks. The harmony between the warm, soft golden hues of the A-Grade teak and the included Sunbrella® cushions gives is a nonchalant feel and helps you to focus on really enjoying yourself. The ultra plush cushions include 9 inch back and seat cushions to really encapsulate you in softness. As some of our customers remark: “it’s like sitting on a down cushion”. 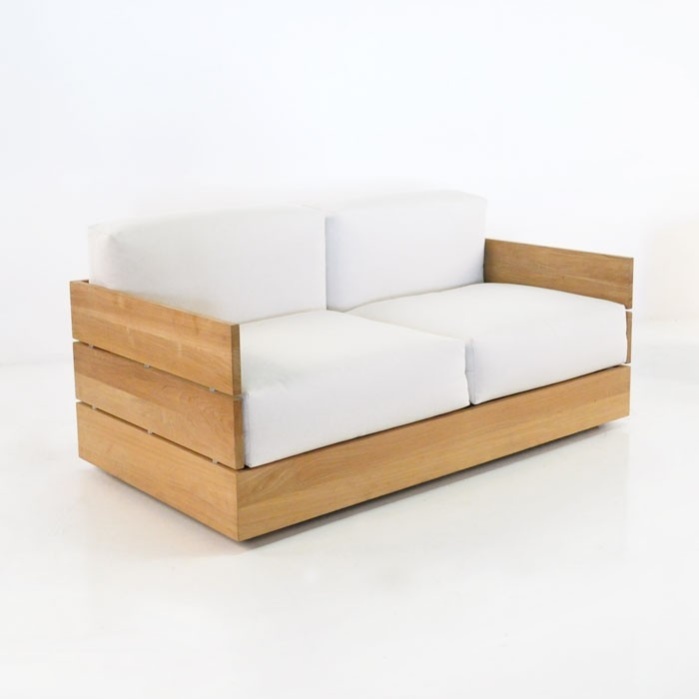 Down wouldn’t survive the harsh weather this piece of furniture was built to handle, but you truly do get exceptional comfort in this outdoor loveseat. The inherent qualities of the teak and the fade resistant and moisture tolerant cushion materials allow you to use this teak loveseat to create your own outdoor spa. Furniture like this can be enjoyed year round and be counted on to always put you first on the list of priorities. 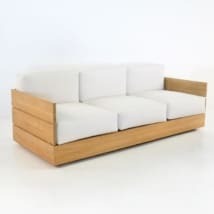 The considerable planks of teak that form the outside shell of this teak outdoor loveseat are over 6 and ½ inches wide with a thickness of 1 inch. 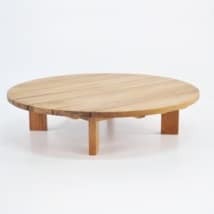 The design really showcases the neutral warm tones of the A-Grade teak. It evokes the traditional attitude of spa furniture because of the clean lines but smooth edges; the comfortable cushioning and the carefree vibe. This loveseat really invites you to take a different approach to your backyard, by turning it into a resort that’s only a few feet away from you. The hidden inner frame and support system gives this outdoor loveseat(and the whole Soho Collection) a floating look, to complete that effect of relaxation and luxury that everyone gets when they take a Spa day. You can find that same type of gratification and tranquility that comes from a relaxing day at the Spa with the Soho Loveseat. Only you’ll have access to it 24 hours a day 7 days a week, a few steps away on your patio. With this affordable outdoor loveseat, you’ll be getting the same qualities you would find in the most luxurious and expensive custom pieces, without the high price.